Do you know how much money you will need per year in retirement? Do you know how that number will be affected by inflation? 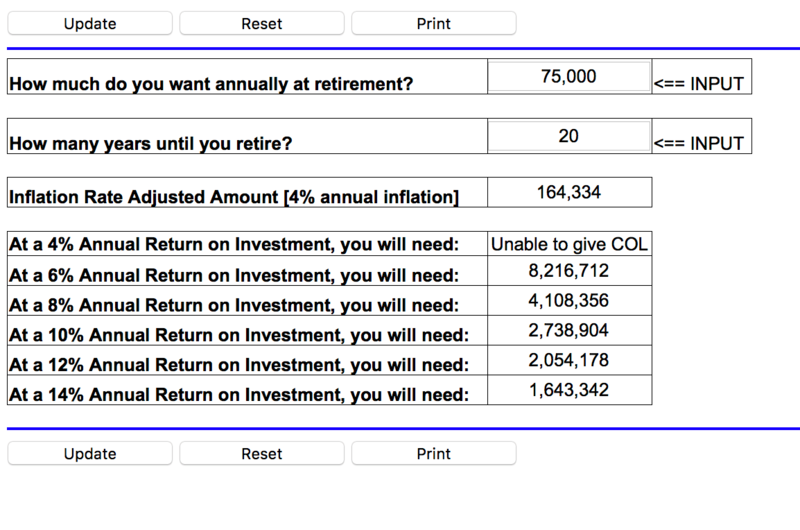 I would encourage you to check out our Retirement Nest-Egg Calculator Tool. While it may trigger a shock to your system when you see the numbers, it can help you get into gear to retire well. This calculator is incredibly easy to use and only needs two pieces of information from you! All you need to do is enter the amount of money you would like annually in retirement and how many years until you expect to retire. After that, the calculator will compute the amount of money that you need to have saved and how different annual rates of return will change that number. The calculator assumes that you will never touch the principal. The calculator assumes that you will give your nest-egg a “cost-of-living-raise” of 4% each year. This calculator adjusts the “annual amount your want” for an average annual inflation of 4%. So, at 4% annual inflation, I will need $164,334 per year in 20 years to have the same purchasing power that $75,000 has today. The bottom six rows tell you what you need to have in your nest-egg at different rates of annual growth. At 8% annual return, I would need $4,108,356 when I retire. That number drops significantly if I expect growth of 12% and I would only need $2,054,178 when I retire. These numbers may seem astronomical and you might feel like you will never build a nest-egg of that size. But remember, the power of compound interest can work in your favor! By starting early and investing consistently, you can watch your nest-egg grow to numbers you may have only dreamed of. Are you ready to have a debt free Christmas this year? We are already at the end of November and Christmas is less than a month away. During this episode, Joe will share exactly what you can do in order to complete your Christmas shopping without incurring any additional debt. Joe has an update on the U.S. National Debt and we have a success story about a couple who created their first ever budget without an argument. Joe shares alarming information about the U.S. National Debt. Megan shares a success story about a couple who created their first ever budget without an argument. Joe explains what you can do in order to have a debt-free Christmas this year. Happy Black Friday! It’s the biggest shopping day of the entire year and I think you deserve a deal from us too! As you continue to stuff your face with Thanksgiving leftovers, you can enjoy Black Friday all weekend long as our entire store will be discounted. Everything is 20% off PLUS free shipping! Don’t miss it! By getting our material in your hands after this weekend, you can not only work to have a debt-free Christmas, but you can also set yourself up to have a fantastic year in 2019. Make sure you check out our online store this weekend because if you wait until Monday, they will be gone! Black Friday deals are probably piled up on your kitchen counter and overflowing your inbox right about now. Companies start promoting these deals at the beginning of November and most of the time cannot even wait until Black Friday to start selling! These sales are a great way to cross items off of your Christmas shopping list but can also become budget busters without the proper planning. You don’t have to spend January afraid of the credit card bills coming in, you can use our Christmas Mini-Budget to get Black Friday ready. 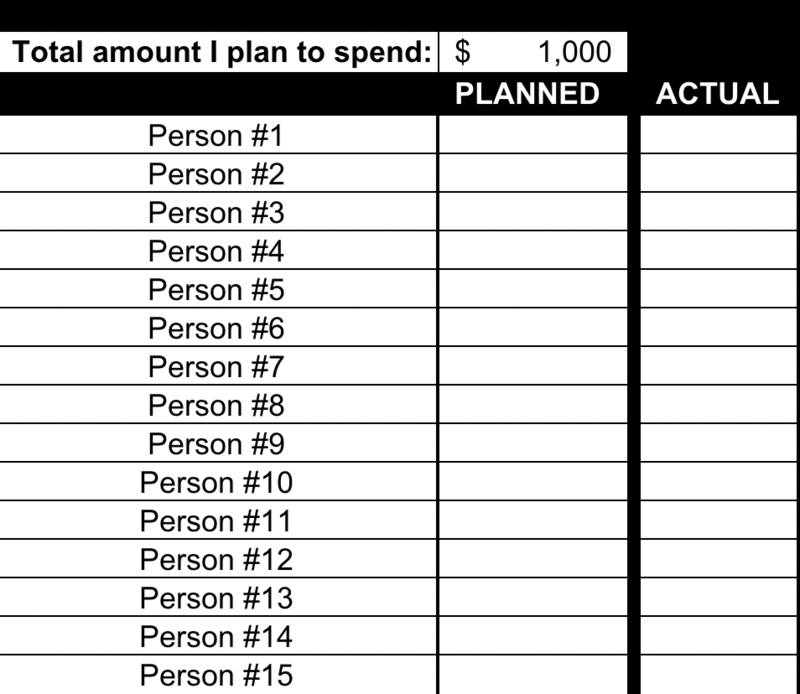 This budget tool is incredibly simple to use and does all the math for you. All you have to do is enter the total amount you want to spend this Christmas season and then list each person you plan on buying a gift for. Make sure you include everyone that you will spend money on, if they don’t make the list, they don’t get a gift. It might sound harsh but you don’t have to spend money on every single person that you know. After you have listed the amount of money you want to spend and the people you plan to spend it on, you can begin to divy up your spending. Next to each person’s name, put the dollar amount that you plan to spend on them. 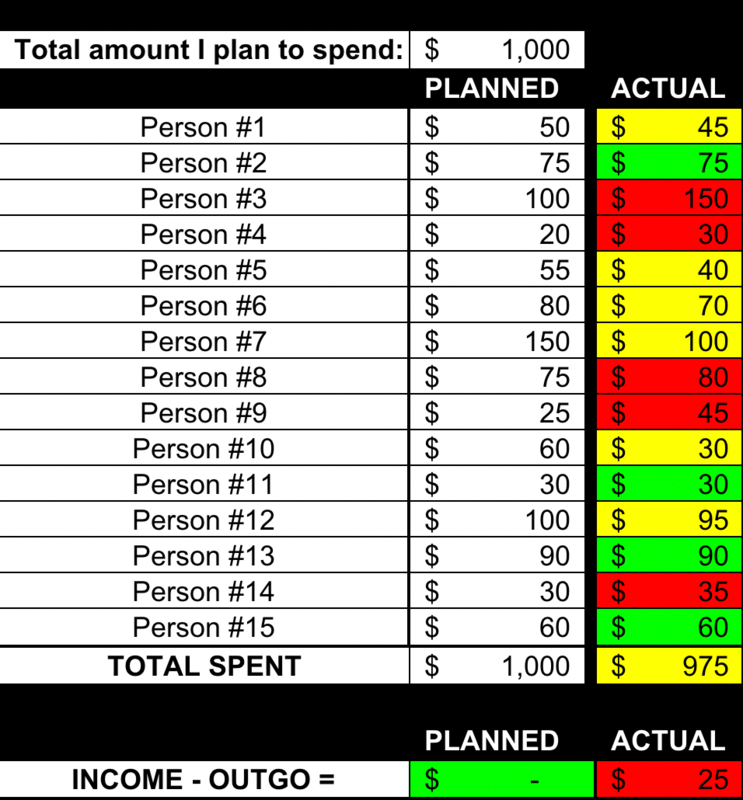 You’ll notice as you start adding in numbers that the bottom of the spreadsheet will change colors. Like all of our budgeting templates, the trick is to make you INCOME – OUTGO = EXACTLY ZERO. Once you have accomplished this, the cell will turn green. 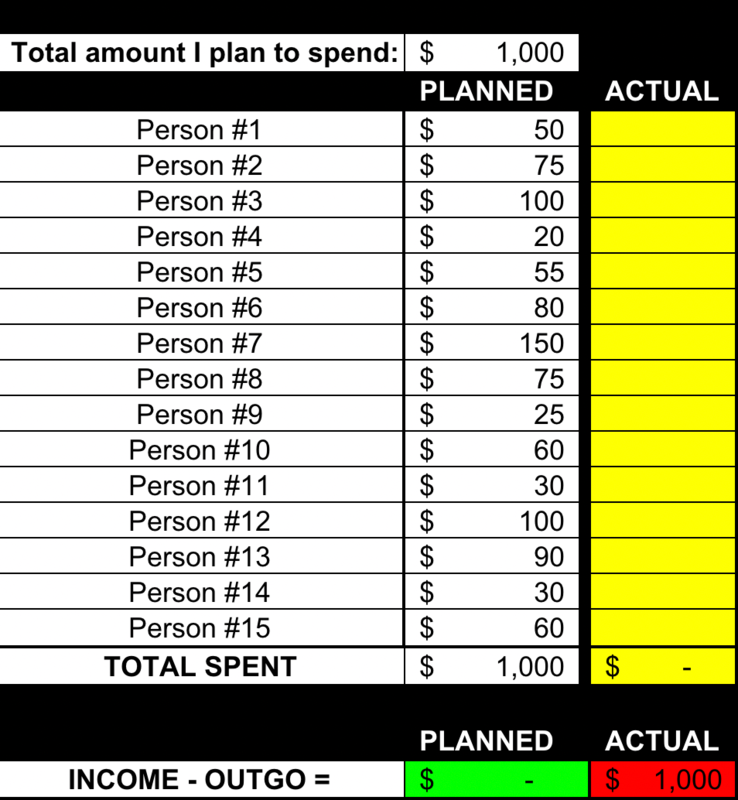 Until you begin making purchases, the “actual” column will be yellow. This indicates you still have money to spend. When you actually buy the gift, record that in the actual column. If you spend less than you planned, the cell will remain yellow. You can either spend more money or reallocate those funds to another person. If you spend the exact amount you planned, the cell will turn green. On the other hand, if you spend more than you planned, the cell will turn red. You either need to take that money from someone else’s gift or take the gift back and find one within budget. You’ll know when your budget equals EXACTLY ZERO on all fronts when all of the cells turn green. Black Friday and Christmas shopping don’t have to be stressful. With the proper planning you can avoid going over budget and putting yourself in debt to start the new year. Download the tool today and make this Christmas a debt-free one.